Updated Oct 26 2012: I just preordered an iPad mini to compliment my iPad 3. And now there is an iPad 4 which replaces the 3. Retina is awesome but I’m expecting the iPad mini arriving November 2 to be good enough for 75% of my use (it is quite a bit better than iPad 2 which isn’t half bad) and very enjoyable being half the weight and thinner than iPhone 5. You decide! I got the iPad 3 on day one on preorder — the Verizon 64gb model. The 2048 x 1536 pixel retina display is a game changer. A booster rocket from which there is no return. Reviewers had trouble explaining their reactions but calling the retina display transformative nails it. Based on the information I had, I decided to double-down on iPad and get the best available model. I have not regretted it for a moment. Since the iPad IS a screen, the quadrupling of pixels adds value like no other upgrade could. It’s not a feature like a camera that you might not use. It’s a window to see through. The new screen makes content more real and immediate. You feel like you can reach through the glass. All apps look a lot better even the ones not upgraded. And the upgrades are rolling in every day. The best, most popular apps are now optimized for this display. Apple’s retina-ready text engine yields immediate benefits. My favorite text-heavy apps like iBooks, Reeder, iA Writer, Instapaper, Tweetbot and Terminology dazzled on day 1. The new iPhoto app, already a great pleasure in iPad 2, is a joy with photos gaining much greater clarity and color saturation. 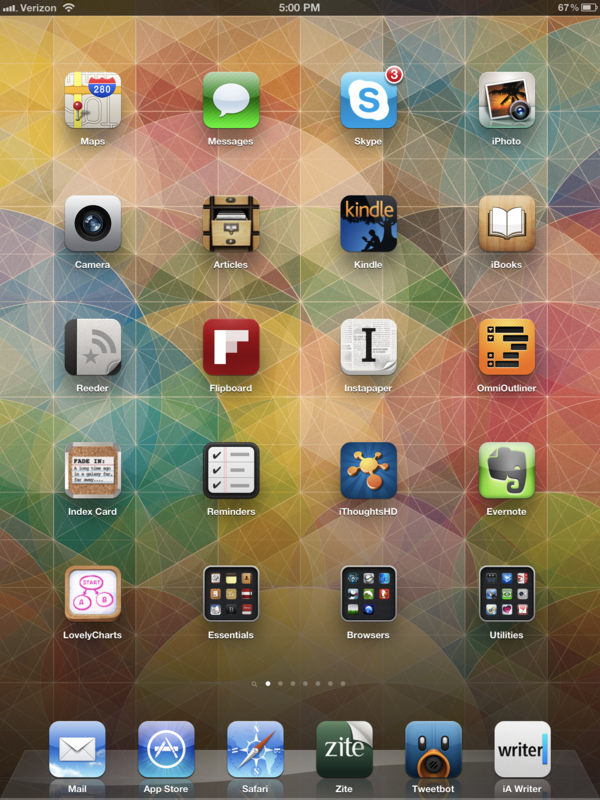 One reason I am so happy about all this is that a better iPad means better apps immediately. And, this fuels app purchases fueling the R&D efforts of the most talented app developers. Ever since the iPhone 4 came out and showed us what’s available with a vastly higher Rez screen, I’ve been waiting for the iPad to follow suit. Now we get a big, easy to operate screen and high resolution in one package. Who Should Buy a new iPad? I’m speaking to Knowledge Professionals here and serious students not yet in the work force. Everyone. If you strive to be a professional knowledge worker, then knowledge is your game and your eyes are one of your key assets. Your eyes will thank you. More important is what your level of engagement and sheer pleasure will be in your reading and operation of this device. When it comes to knowledge, you get what you give. Something becomes interesting, when an interested mind shows up. That interest is nourished by great content and is enhanced by this incredible display — plus all the other wonders of the iPad like a clean, consistent user interface and unparalleled responsiveness to touch. If you were only playing games and not a game designer, I might hesitate. But, you are a reader, writer, speaker, thinker, designer and possibly artist. Don’t skimp on your axe. Tools matter. This investment is a good one. If you own an iPad 1, the increased speed and responsiveness is very noticeable. If you own an iPad 2, surely there is someone who would like it. The screen alone is enough. You are a professional or have aspirations to be. This is an investment. Re-read the previous paragraphs, go to an Apple store and bring your iPad with you for comparison purposes. Economize on something else that doesn’t have as much importance for your future. Buying a bargain-priced used iPad 2 is a half measure, but if that’s your best shot right now, go for it. The Camera. The much better camera should not be completely disregarded even though this update is all about the screen. If you don’t have an iPhone 4 or recent point-and-shoot camera, your iPad 3 might be the best camera you have with you. In any case, the iPad has a much longer battery life than an iPhone or other smart phone. Photography eats batteries alive, you may need the juice the iPad supplies for photography. Once taken, use the new iPhoto app to make the most of the photo in a few moments or longer if you have the time. Use the iPad to send that photo where you want it. The LTE. It will cost you $129 to have the option to turn on cellular access when wi-fi is not available. I turned on $20 worth (1gb) of data for my first 30 days assuming I will only use LTE or 4G or 3G as a quick fix in the car or in that occasional spot when stranded without wi-fi and needing a connection. So far that’s how it is going in fact I’ve only used 100 mb or 10% in the first few days. Getting LTE in the Mill Valley Safeway parking lot while waiting for my partner to buy a grocery or 2 was a thrill. You’ll like the option to load a page fast on LTE now and then when the *free* wifi is slower than molasses. Is iPad 3 a Knockout Blow to Competitors? I expect unprecedented sales for iPad as a result of the retina screen alone. If you thought the masses were lining up behind iPad making it hard for other tablet-makers to compete, get ready for a big uptick. At the same time I fully expect the most hardy tablet makers like Samsung, Amazon, HTC and a few others to raise their games to try to compete. I wish Palm were still in and hope RIM keeps at it. Microsoft, with its installed base globally on PCs, has a shot with its coming Windows 8 tablet. But, it could take a while and who knows what Apple will do for an encore?